Iam going to make homemade paneer which tastes good than the store bought .This is easy to make(within 20 minutes minimum time). We can store paneer both in the fridge or freezer depending upon our need.If we are using frequently then we can store it in fridge. If we want to store it longer then put it in the freezer. when paneer needed dishes have to be done in a jiffy and if am running out of time then I use the store bought one.My son likes the taste of paneer very much and he eats it as such.Homade paneer is high in quality than any other commercial brands. 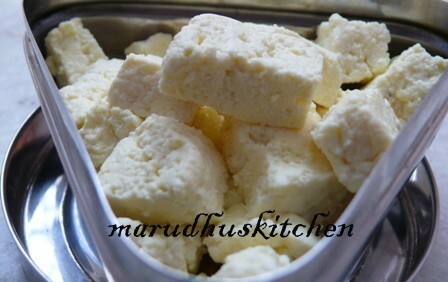 paneer is a fresh form of cheese .Starting from Nepalese to Bangladesh most of the south Asian cuisine have paneer in their cooking .It is a rich source of to milk protein.Its soft crumbly texture from which a wide varieties of deserts and gravies can be made.’Palak paneer’ and ‘paneer buter masala’are very popular around the world .For making paneer every body have their own method of preparation. Other than lime juice, vinegar and curd is also added , I personally use lime juice.Here I have provided step by step recipes for you to follow. the whey should seperate from the milk as shown above. strain it with a strainer. put it in muslin cloth or any strain able cloth put weight on it as shown. remove it make pieces and store. It can be stored in fridge for 1-2 weeks. In freezer it stays well for months. then use in whatever dish you want. I tried this homemade paneer recipe it came out very well and thank you so much.Hereafter I will be making my own paneer and no need to buy paneer packet.